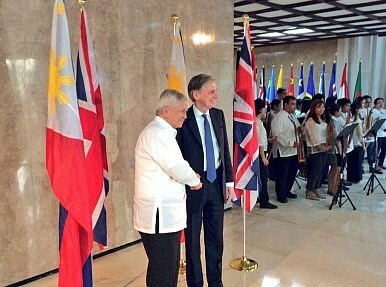 British foreign secretary Philip Hammond meeting his Philippine counterpart Albert del Rosario earlier this month. Britain’s ambassador says a fresh and more robust agreement could be concluded soon. The Philippines and the United Kingdom are looking to ink a new defense agreement by the end of 2016 as the two countries mark 70 years of diplomatic relations, Britain’s envoy to Manila revealed January 18. According to local media outlets, Britain’s ambassador Asif Ahmad said that London and Manila are currently exchanging draft agreements following high-level talks in 2015, with a new pact expected by the end of the current calendar year. “It’s actually being redone now. We actually have an existing one but by the end of this calendar year we want to establish a new one,” Ahmad said at a roundtable discussion. Ahmad revealed that the new pact, which could be expected well before October this year, would be more substantive, addressing what he termed the lack of ambition in the previous one which had limited the scope of security cooperation. However, he clarified that the agreement should not be compared to the Visiting Forces Agreement that the Philippines has with the United States in that it was focused more narrowly on formalizing and regularizing provisions of expertise as well as protocols and exchanges. The pact was reportedly discussed when British foreign secretary Philip Hammond made his first official visit to the Philippines earlier this month and met with his counterpart Alberto del Rosario as well as Philippine president Benigno Aquino III. The two countries have been exploring how to broaden what the British Foreign and Commonwealth Office recently termed their “growing strategic partnership.” Ahmad said he did not rule out the conclusion of a formal strategic partnership between the UK and the Philippines further down the line. While he did not delve further into details since the pact is still being finalized, Ahmad did reveal that he expected it to touch on issues including the British troops training their Philippine counterparts and boosting interoperability in areas like disaster response and recovery. For instance, he noted that both countries wanted to incorporate lessons they had learned during Typhoon Haiyan in November 2013, the deadliest typhoon in Philippine history that had killed more than 6,300 people. In aiding Manila following Haiyan, it became clear to the UK that there were very few written protocols on such cooperation and that it would have to be done informally, he said. Philippines Gets New Israel Missile System for its Attack CraftFrigate Controversy Puts Philippines’ Military Modernization Challenges in the SpotlightWho Will Be the Philippines’ Next Military Chief?Who is the Philippines’ New Army Chief?What Will Australia’s New Military Terror Aid to the Philippines Look Like?